This is my entry for the November edition of the Japan Blog Matsuri, which this month is hosted by the one and only Ashley of Surviving in Japan (without much Japanese). And this month's theme? Yep, you guessed correctly. Food! Or rather - "Fall is the season for eating." And frankly, when you say "Utsunomiya", there's only one kind of eating that comes to mind. No question about it. As soon as you mention "Utsunomiya" to pretty much any random Japanese person, his or her immediate reaction is "gyoza... hmmm... yummy... I'm hungry...". Yes, Utsunomiya, thanks to a persistent country-wide (or at least Kanto-wide) advertising campaign, is now considered the Japanese capital of gyoza. A self-proclaimed capital, that's for sure, but eventually, the reputation has managed to catch up with the lofty title, and now the gyoza here is actually pretty good. And I, for one, am not complaining. It could have been much, much worse. Just imagine the possible alternatives: Utsunomiya - the capital of shimotsukare - a local wholly native Tochigi delicacy a.k.a. barf on a plate, or Utsunomiya - the capital of monjayaki a.k.a. barf on a hotplate? Nah, I'm perfectly happy with gyoza. What's gyoza? A dumpling by any other name. Chinese pierogis, if you will. So you have a city that claims to be the Japanese capital of fried dumplings, and what does this city do? Every November it throws a gigantic gyoza party known as the Utsunomiya Gyoza Matsuri. And this year it took place on November 6th and 7th, in other words - this weekend. 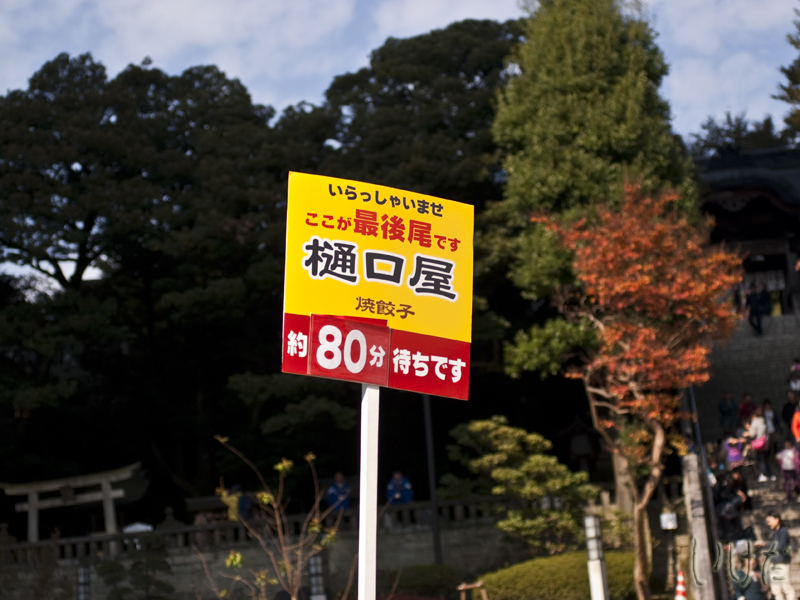 Gyoza Matsuri sign right in front of Futaara shrine, 13 gyoza stands were located there. 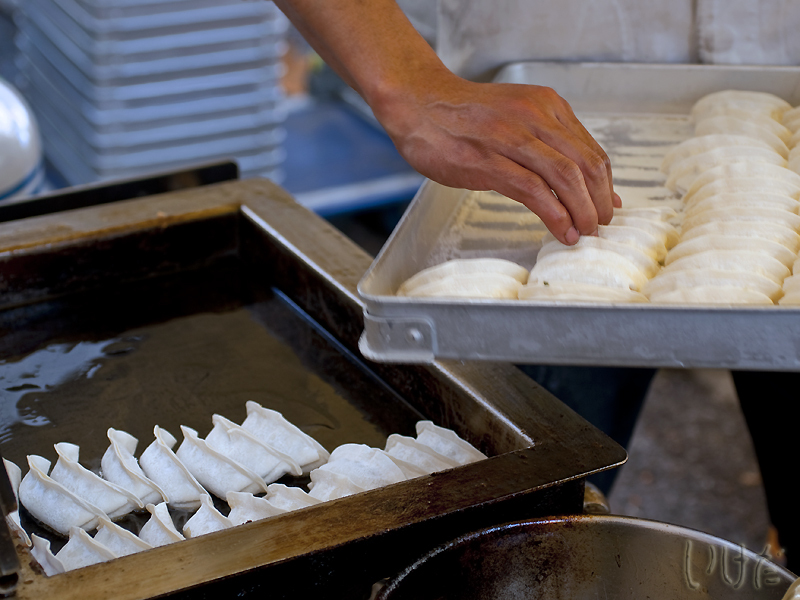 What happens during Gyoza Matsuri? 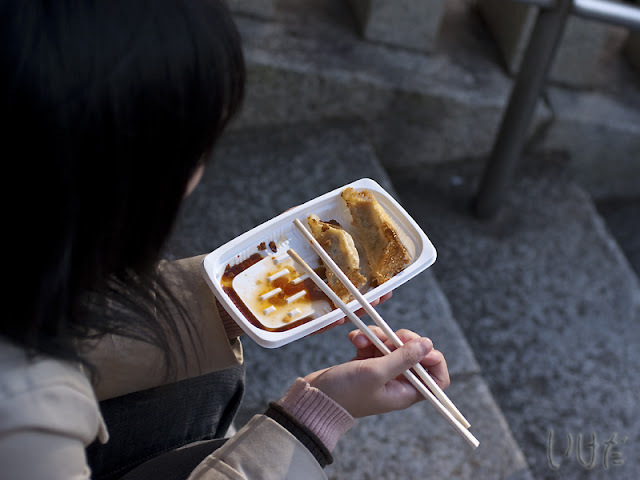 All the gyoza shops crawl out of their usual holes in the wall and take to the streets. And sell, sell, sell gyoza, gyoza and more gyoza. And since 4 pieces of gyoza cost only 100 yen, as you can imagine, they sell quite a lot. And the lines are long. Very long. Here the sign says that the wait is about 80 minutes. Wait 80 minutes to buy dumplings? I'd die of starvation before I get to the counter! So yes, people wait, people buy, people eat. And eat. And then eat some more. This is exactly what I did this weekend. Except I looked for lines that were 30 minutes max. What can I say, patience was never one of my virtues. And between all that waiting in line and eating, Dr Trouble and I also managed to meet up with a fellow Tochigi blogger who came down to Utsunomiya to join in the dumpling fun - Edward of Japundit and Japan Talk Podcast. Good times all around! We ate, we chatted and vowed to do it again sometime soon. Sadly, due to financial constraints (this blog isn't called "Budget Trouble" for nothing, you know) I won't be able to travel to Kobe for the Japan content creators meetup in December. But if you're going there, you get to meet Edward and many other Japan-based bloggebrities. Please say "hi!" to them from me! 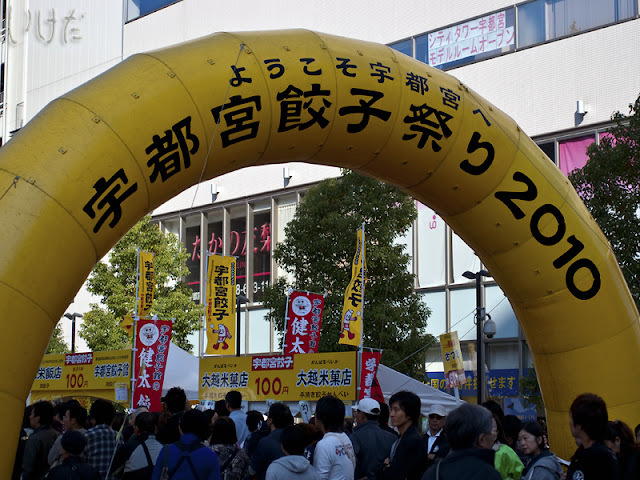 As you can imagine, an event like a gyoza festival produces huge amounts of garbage. And as you probably know, trashcans in public places are hard to find in Japan. By the way, yesterday inside the JR Station in Utsunomiya all trashcans were actually taped shut and signs "please take your trash with you" were posted. Needless to say I wasn't too happy about it. 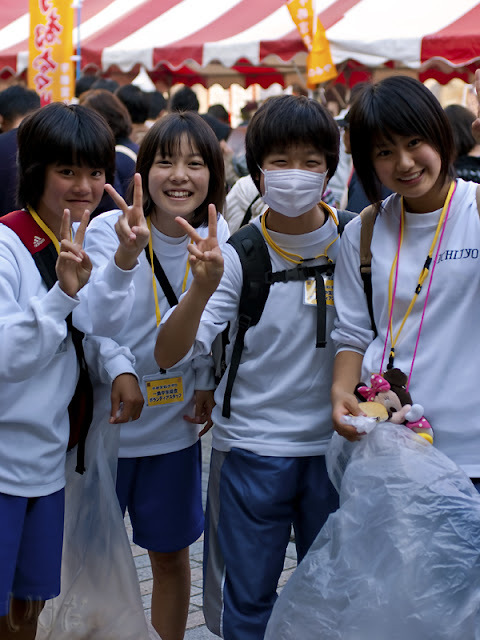 Fortunately downtown, where the gyoza fest was taking place, cardboard trash boxes were provided, and as every year, Ichijyo Junior High School students were on garbage duty. Boys and girls were prowling the streets with huge plastic garbage bags making sure that no container was overflowing or nothing was discarded on the ground. The kids were super pleasant, helpful and mostly English speaking. And not shy about showing off their foreign language skills. In addition to gyoza there were also other attractions. 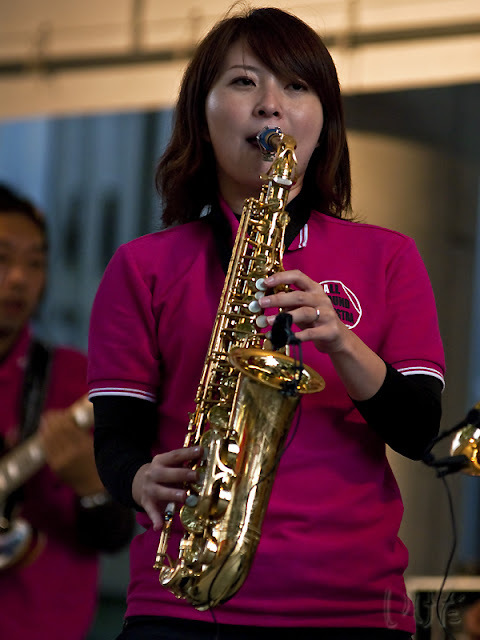 You see, Utsunomiya fancies itself to be a city of jazz, too. And true to the official city image, the streets were jazzy. Very jazzy indeed. Every square in the city center was turned into a music stage and free jazz concerts (under the banner of Miya Jazz Inn) were going on non-stop as part of the festivities. One band that we particularly enjoyed was All Around Orchestra (sorry, their website is in Japanese only). They may not have been the best musicians, or had the cutest band members, but what they did have was great energy and personality. You could tell they had fun playing and entertaining the audience. What a refreshing change from the standard stiff, serious, and self-possessed Japanese stage presence! And this is the summary of the weekend in video form. Gyoza provided by the numerous street stands. Jazz provided by All Around Orchestra. 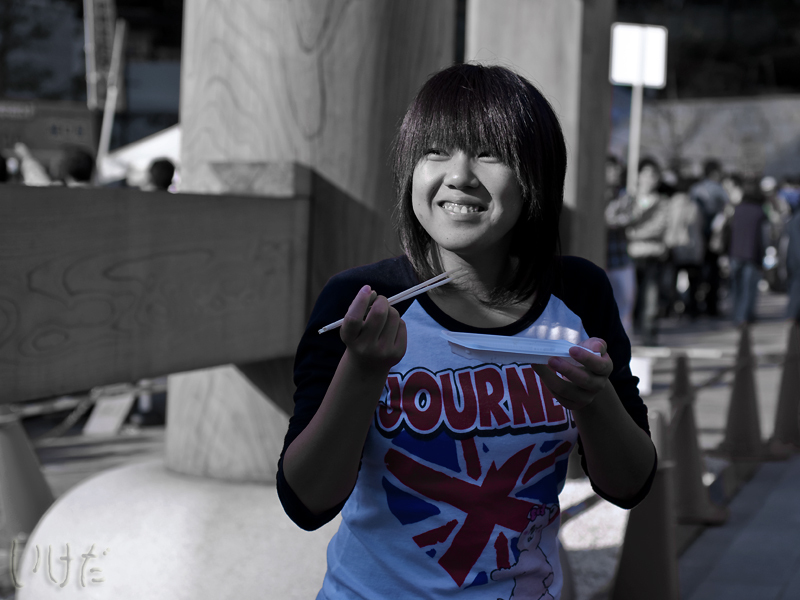 And that concludes our report from Utsunomiya Gyoza Matsuri 2010. It was yummy. Let's do it again next year! More photos of the event can be found on Tochigi Daily Photo.